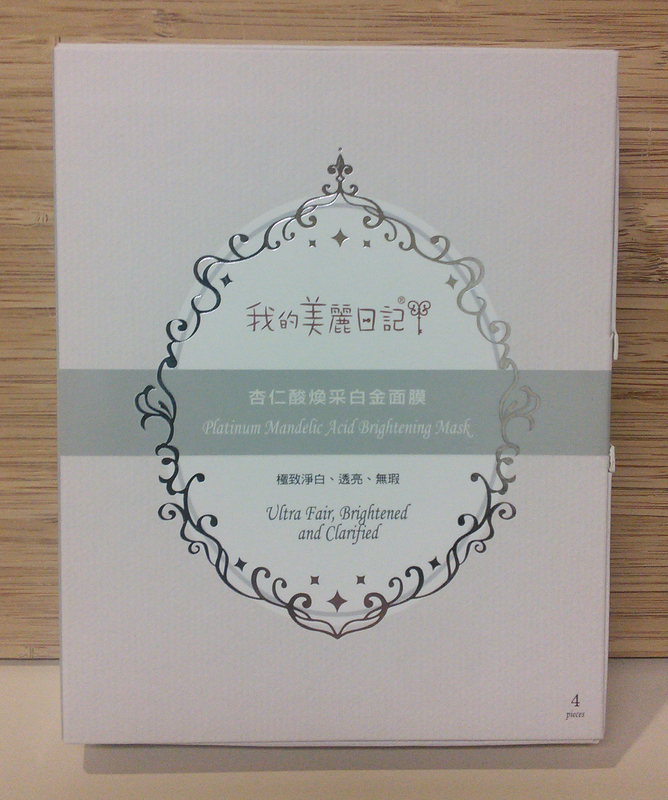 After many trials and tribulations, I’m finally ready to review the My Beauty Diary Mandelic Acid Brightening Mask! But before we get into it, let’s talk about this mask’s learning curve. Because I’ve never before encountered a mask that had a learning curve. The higher cost per mask, the fancier package design, and the superior ingredients list make these one of MBD’s more premium masks. They wouldn’t have had a learning curve if I’d bothered to read the instructions ever, but I’m so accustomed to sheet masks by now that I figured the process would be the same for these as it is for every other mask I’ve used. You may already know about my first Platinum Mandelic Acid mask mishap. What you don’t know is that even after that blunder, I didn’t bother to look at the instructions, so the second time I used this mask, I screwed it up in a different way. The mask sheet itself is so thin, so soft, and so soaked in essence that if you allow it to fold in on itself or get bunched up, it will be impossible to straighten back out. Just so you know. I did it right the third time. That means that now I only have one left. Does that make me sad? Read on to find out. 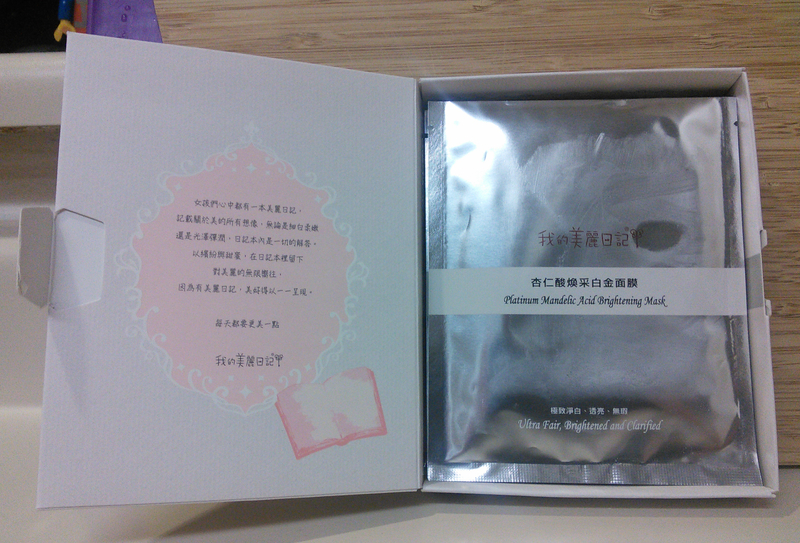 Actually, the box packaging reminds me strongly of Etude House. Anyone else see it? Purpose: The My Beauty Diary Platinum Mandelic Acid Brightening Mask is touted as an intensive whitening, brightening, and clarifying mask. The inclusion of mandelic acid in both the ingredients and the product name implies that the mask will accomplish this through chemical exfoliation. Do not use if: You are sensitive to AHAs; citrus, seaweed, or other botanical extracts; or anything else in the ingredients list. When and how to use: Because this mask theoretically has some potential chemical exfoliant functions, I put this at a different stage of my routine than normal. Instead of applying the mask as the last stage of my routine before creams, I applied it following my standard 30-minute wait time after AHA, then applied essence, serum, ampoule, and cream afterwards. It is very important that you apply this mask correctly. 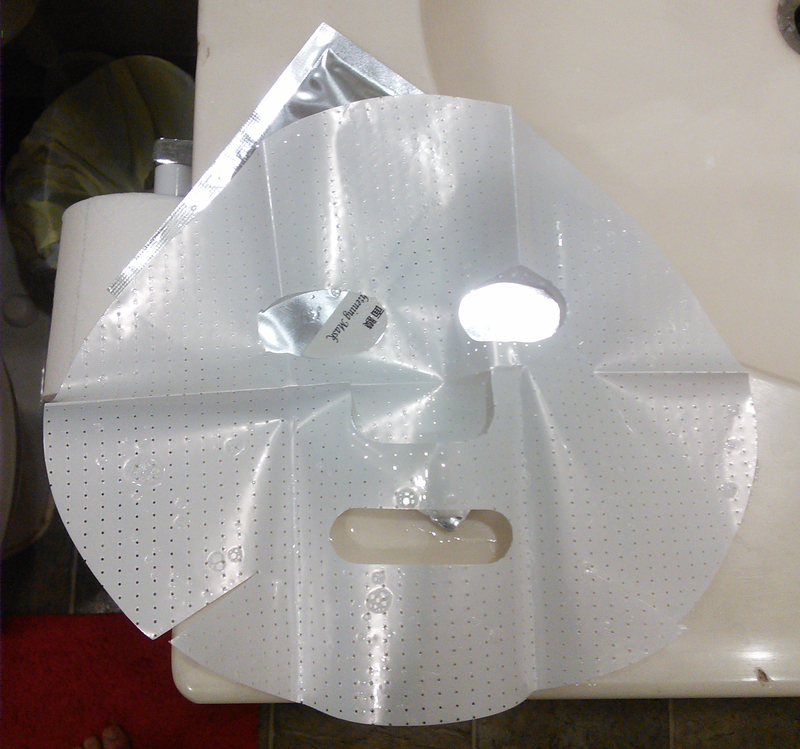 When you take it out of the packet, the actual mask itself will be sandwiched between two backings: a stiff blue paper backing strongly reminiscent of the material used to make those disposable paper gowns they make you wear at the doctor’s when you’re about to have a needle jammed into the fleshy part next to your A-Sol, and, on the other side, a perforated plastic backing. The plastic bit. This is the easiest part to recognize as a backing. Remove the plastic backing but not the blue paper one. This is very important. DO NOT REMOVE THE BLUE PAPER BACKING. Now look very closely at the blue backing in order to make sure you know which side the actual mask is on. It will have been on the side from which you peeled off the plastic, but just make sure, because the mask sheet is quite thin and translucent, and I don’t want you to make the same kinds of mistakes that I made. I’m helpful like that. After you’ve identified which side of the blue sheet the actual sheet mask is on, apply both sheets with the mask side on your face. The blue backing will make it easier for you to get the mask sheet onto your face without having to fiddle with the sheet itself, because as I said above, if it bunches up or folds in on itself, it is so thin and sticky to itself that it will be pretty much impossible to straighten out. Got both sheets on? Great. Now carefully peel off the blue backing without taking the mask sheet with it and adjust the mask sheet on your face as needed. Yay! 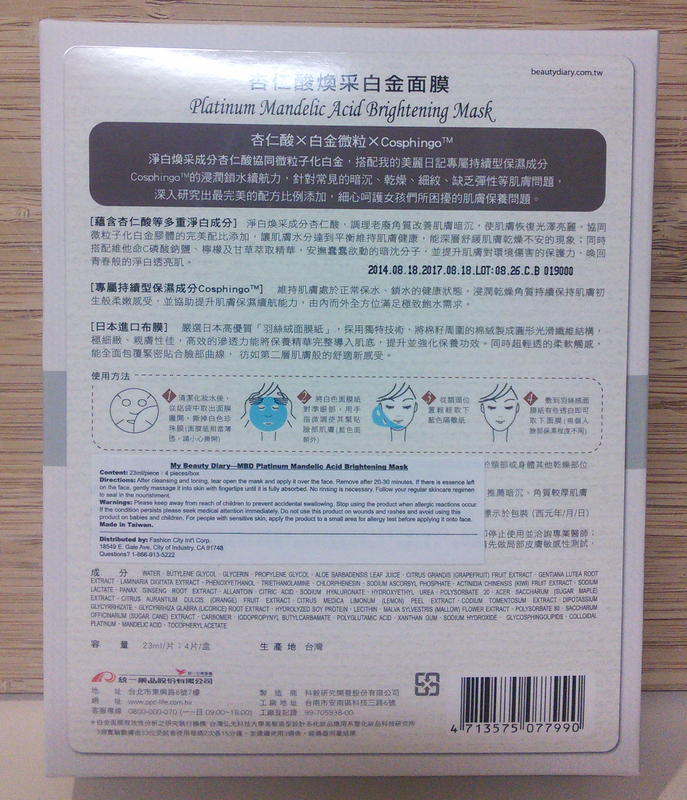 You have successfully applied your My Beauty Diary Platinum Mandelic Acid Brightening Mask! Wear for 20-30 minutes as directed by the instructions, then remove and pat in remaining essence. Continue with the rest of the steps of your nighttime skin care routine. There’s less glare on the box photo than there was on the foil mask packet, so here’s the back of the box. Notable ingredients: Whoa, baby! Take a look at all the extracts in that ingredients list. There are antioxidant-rich extracts, including laminaria digitata (kelp) extract and panax ginseng root extract. Kiwi and orange fruit extracts, among others, provide a boost of brightening moisture. This mask contains licorice root extract, one of the most potent and proven botanically derived brightening agents–a promising start. And, much like the wonderful Etude House I Need You! sheet mask in Vita Complex, the My Beauty Diary Platinum Mandelic Acid Brightening mask contains SAP, a stable form of vitamin C that has both antioxidant and brightening functions. And colloidal platinum is said to have antioxidant and possible anti-aging potential, though to be honest, I don’t buy that. Either way, it’s very very low in the ingredients list. My CosDNA analysis of the mask is decent. Only a few ingredients out of that long list triggered warnings: carbomer gets a 1 as a potential acne trigger, butylene glycol gets a 1 as a potential irritant, and the common pH adjuster triethanolamine gets a 2 in the irritant column. Remember, however, that CosDNA is not the ultimate authority, since its database doesn’t contain every ingredient ever and skin care is YMMV anyway. If you’ve experienced reactions to any ingredients in the ingredients list or ingredients like them before, patch test first! Of course, this mask also boasts the AHA ingredient mandelic acid. Let’s take a closer look at that. So. This mask has “mandelic acid” in the name and is a brightening mask. You’d think it might have some serious exfoliating potential, right? Mandelic acid is the second-to-last ingredient in the list, right below colloidal platinum. (Which, incidentally–isn’t it funny that the two star ingredients from which the mask gets its name are among the two ingredients the mask contains the least of? Yay marketing.) As we know, AHAs need to be at a concentration of between 5 and 8% in order to effectively exfoliate. While MBD doesn’t give the exact percentage of mandelic acid this mask contains, its position in the ingredients list is a pretty sure indication that there isn’t enough in here for that purpose. Another prerequisite of AHA chemical exfoliation is a pH of between 3 and 4. Lower than 3, and you run the risk of chemical burns; higher than 4, and it won’t exfoliate much, if at all. Guess what the pH of the My Beauty Diary Platinum Mandelic Acid Brightening Mask is? 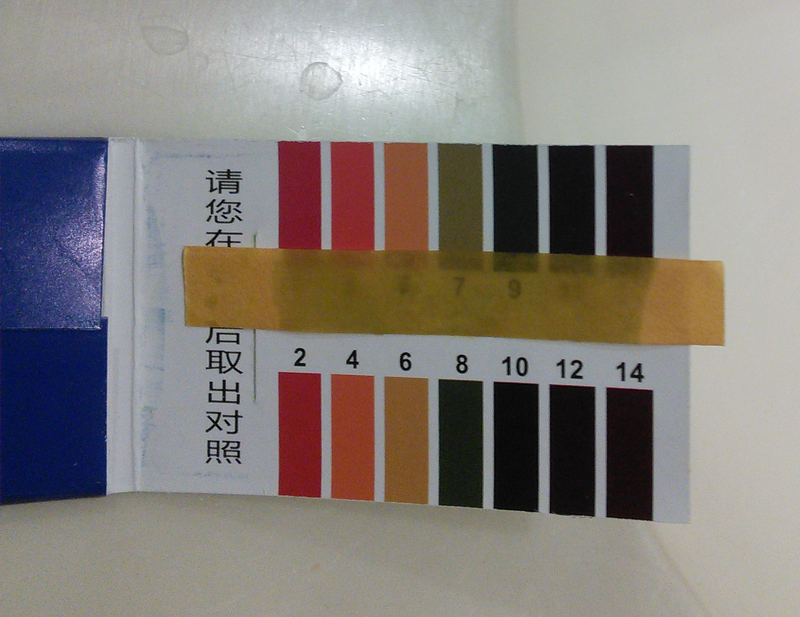 pH test of My Beauty Diary Platinum Mandelic Acid Brightening Mask. I tested two different masks out of this box and used at least two pH strips on each mask in order to make sure of my results. pH strips like the cheapo ones I’m using aren’t the world’s most accurate, but they are useful for giving a general range, and based on my squinting assessment of the strips I tested these masks with, the pH of the essence works out to somewhere between 6 and 7. pH is a logarithmic scale, so that is orders and orders of magnitude higher than what’s required for effective chemical exfoliation, even if the concentration were high enough, which I’m confident it isn’t. So. We can conclude from this that the MBD Platinum Mandelic Acid Brightening Mask does not brighten through any kind of intensive AHA exfoliation. Still, I’ve used plenty of sheet masks that don’t rely on chemical exfoliation to brighten, and that do brighten effectively, so this is no reason to write the mask off. Marketing BS is annoying, but sometimes great products really do hide behind marketing BS. I’ve already talked about the complicated application process and the extreme thinness of the mask sheet, so we’ll skip those parts and head straight to how things go once the mask is on. I’m not sure if this is a “come hither” look, a simple vacant stare, or an “I’m going to murder you and replace the peeled-off murder skin I’m wearing on my face with yours.” You decide. The major advantage of the onion-skin-thin mask sheet is that it adheres very closely and tightly to the facial contours–it’s the most “second skin”-like mask sheet I’ve ever worn. I was able to talk, smile, and laugh comfortably without dislodging the material at all. Usually my masked face is as stiff and expressionless as that of a Botox junkie with fresh lip injections, so this was a pleasant change. While wearing the mask, I noticed a very subtle tingling, itching sensation, not enough to be unpleasant but not enough to fully ignore. It’s my understanding from reading people’s experiences with mandelic acid that this is pretty common, so I wasn’t too concerned. The mask sheet was dry enough to remove after about 30 minutes, which was as long as I’d planned to wear it anyway, not wanting to risk irritation or overexfoliation in case I’m wrong about its lack of exfoliating effectiveness. At first I was a little disappointed with the results. My skin was noticeably brighter and more even than it had been before I put it on, but not any more so than what I might get from other sheet masks I’ve tried, including many made by My Beauty Diary. I did have to pull back and check my expectations, however. The “premium” price and packaging of these masks had made me expect some kind of miracle, but in fact normal sheet masks already give me good brightening results, and so did this mask. If this mask had ended up brightening my face much more than a typical mask already does, I’d end up looking like some bizarre modern geisha with a face five shades lighter than my chest. 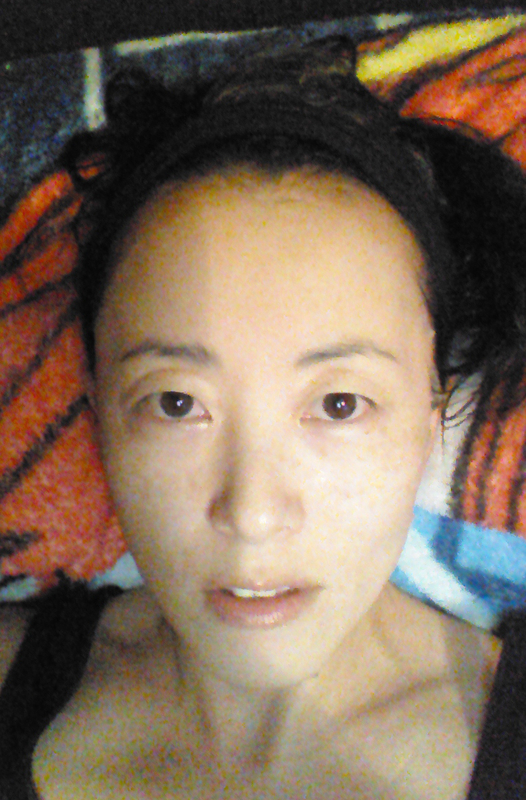 I was more impressed with what I saw the next morning, after I cleansed my face. The brightening was still in effect, skintone remained very even, my skin overall was juicy plump, as it almost always is after an MBD session, and my skin just felt super duper soft. Conclusion: The My Beauty Diary Platinum Mandelic Acid Brightening Mask was a really weird, roller-coaster experience for me. First all my challenges with applying the mask properly, and then my initial disappointment followed by my realization that my expectations had been unrealistically high–I don’t think any sheet mask has ever made me feel so much before. While the actual results of this mask aren’t out of this world, I do have an idea for the most effective use of a box of these: nightly use over the course of four consecutive nights in preparation for a special event. The nightly dose of the brightening extracts will produce a more dramatic end result, better justifying the cost than occasional use would, and your skin really will be incredibly soft, silky, hydrated, and radiant when it’s time to show your face at the event. With that recommendation in mind, I can say that I do like this mask after all. And to answer the question I posed at the beginning of this review, yes, I am kind of sad that I wasted one of the masks, sort-of wasted another, and now only have one left. I’m going to repurchase these at some point to have them handy for exactly the scenario I just described: intensive prep for a special event. Where can I buy the My Beauty Diary Platinum Mandelic Acid Brightening Mask? Have you ever tried any mandelic acid masks? What did they do for you? Whoa that’s pretty cheap for all those ingredients… launching grabbyhands. Right? I’d have to be a hypocrite to complain about the price, considering how much I like hydrogels and how grabby I am whenever Memebox has new masks in stock.